Pragmaticism Is Your Way – It Is Not God’s Way | Truth with Snares!? Some words of wisdom that hung on the wall from Dad to his kids growing up in the Beardsley home, may it be edifying to my readers. So Is All Truth God’s Truth? 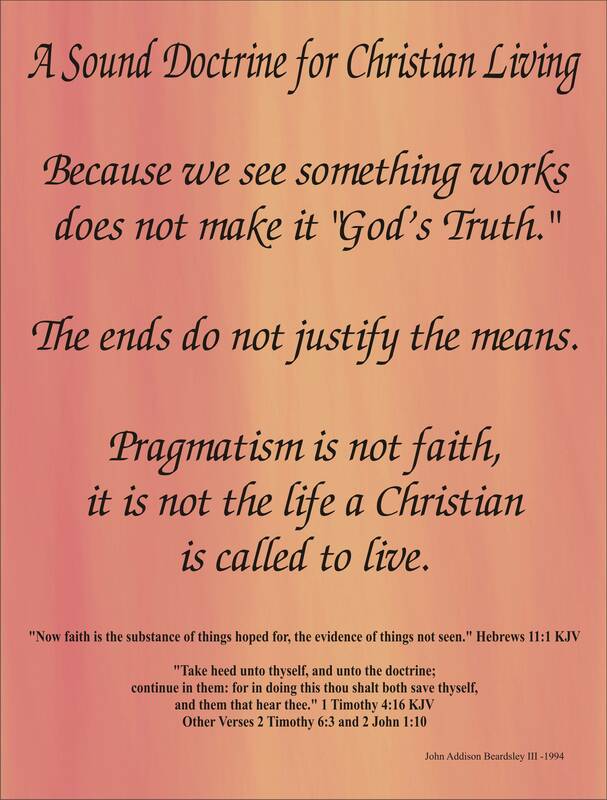 Pragmatism today often teaches all truth is God’s truth and the means often justify the ends . This is contrary to the Christian who searches their Bible to see if this thing is so. Acts 17:11, and John 5:39 Search the scriptures; for in them ye think ye have eternal life: and they are they which testify of me. ← Bad Fruit From Wild Trees! From a Questionable Death, Pastrix Paula White NDCC, to the Mainstreaming of TD Jakes –What Next!